Thought I'd pass it along, in case anyone else was interested. I'm going to the one on Oct. 31st in Albion. I bit the bullet and will be going to this with Melissa. Always wanted to go to a shooting clinic. I'll have a ZS shirt on on Saturday. Hope to see others there too! Rush2112 wrote: TheLight is a pot-kicking man-ape gone wrong. But we still love him and his ability to carry entire trees at once. "Shooters, Your 2 minute preparation period has begun!" The chill from the night is still in the air as I lay down on an old carpet remnant and examine my loaned Ruger 10/22. Chamber flag out, wrap the sling around my arm "hasty" and lie down... 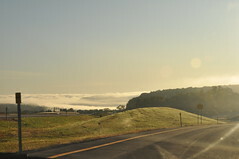 The sun shines at a shallow angle and warms me. It also creates some glare in the tech-100 sights. I focus on the target and dry fire a few times. Wait, this isn't right. I remember the training from earlier: align the sites, create the site picture, control my breathing, focus on the front site, get into the shooters bubble, squeeze the trigger, and follow through... I run it all through my head. So much to internalize! "Shooters, your two minute preparation period has ended. Load!" Two minutes up already! I take the rotary magazine and insert it into the 10/22. I hear the soft click of it locking into place and I rack the bolt. Thoughts run around in my mind, I try to calm myself and get back into my natural point of aim and the shooter's bubble... Shimmy to the left, shimmy to the right... my hand steadies as if by magic. Ah, there it is! All totaled, we launched 716 rounds of ammunition down range over the course of two days. Two folks were awarded a rifleman patch that weekend. Though I was not one of them, my shooting improved significantly, going from a 120 to a 180. Using my own rifle, it will be even higher. I've learned what to practice, how to practice, why to practice. I want to become a Rifleman. I want to teach others. This is only the beginning. I think I just woke up. If an Appleseed shoot comes around your area. Go. You won't regret it. This group and these events get the official seal of awesomeness. Since I learned to shoot five years ago I have been interesting in marksmanship and have worked to improve my aim (mostly from makeshift bench rests to reduce the impact of my tremors). When the opportunity came up to go to this Appleseed shoot I had no idea what I was getting into, but the fact that women shoot for free threw any hesitation out the window. I am immesnly glad to have gone. During the shoot things started off pretty poorly for me between changing rifles a half dozen times and discovering that wthout a rest I was a pretty miserable shot (better now than in a ZPAW I figured). As the weekend went on we started doing more and more drills I was thrilled to see my aim improving pretty vastly after really concentrating on the tips they gave and went from a 95 on the AQT to an 139 by the time the weekend was done. 40 rounds in 4 minutes does take its tole after awhile at the end of the day everyone was pretty exhausted. Derek and I would love to go to more of these and to make them easier to get to I'll be looking into getting a premesis permit to keep a few target 22s in the city, one of the instrustors was telling us it wasn't nearly as difficult as it seemed. Anyone have any experience with this?? Ouch, nice battle wound there, Mel! So, what were the drills like? I'm quite curious, was it all simply target drills, or were there movement drills? Stance-change? What were the demographics like? What are the requirements to earn a rifleman patch? Am I to understand that they provide the rifle? Are you permitted to bring your own. 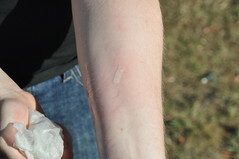 Deschain wrote: Ouch, nice battle wound there, Mel! They started us off on a "redcoat" target to see how folks were shooting and to establish a baseline. This was 13 rounds. Three in each of the torso silhouettes (100, 200, 300, 400 yards) and 1 in the "headshot" box (250 yards). Not really a timed thing. More a progress indicator. ETA: This is not my redcoat. Just an image off the net! The drills were mostly on modified Army Qualification Targets, or AQTs. These targets are posted at 25 meters and simulate a torso at 100, 200, 300, and 400 yards. Max score is 250. Rifleman is 210+ I shot 180 by the end and I considered myself a damned good shooter before this humbling experience. The course of fire is as follows. 4x 10 round magazines. 4 Minutes. 10 in the top (100 yard) standing. Mag change. 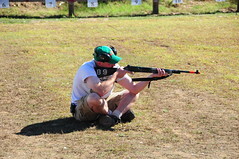 Position change to prone (no rest or support). In addition to all of this, they had us using regular grid-type targets to run speed shooting drills (my accuracy improved greatly at 10 rounds in 20 seconds) and various other siting and position exercises. All of this was on Iron Sights. Man, I could barely even see the 400 yard simulated targets at 25 yards. But I started hitting then often enough with iron's by day two! ais4122 wrote: Am I to understand that they provide the rifle? Are you permitted to bring your own. The rifles we brought were not suited to the drills. Melissa's Savage only had two 10 round mags and my Winchester was a tubular magazine. As you can see from the above drills, neither would have worked well. That being said, there were many folks that brought and used their own rifles. NOT ALL APPLESEEDS SUPPLY RIFLES! 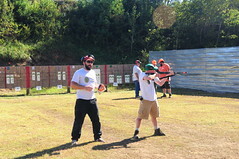 Instructors are completely volunteer. They bring their own rifles and loan them out! The things to keep in mind are: bring 4+ ten-round magazines and use a semi-auto rifle. You could use a bolt, but I found that that detracted from the training on day one as I was fighting the equipment. Everything you learn on the auto will translate over. I want to stress that I've been shooting since I was 7 and considered myself a good shot before this training. After this weekend I feel I have a long way to go and I'm really excited to get there. The clinic helped me get rid of some bad habits and really boosted my score (I started with a 120 and ended with a 180). I plan on trying to become an instructor by next spring if I can. Everyone should go to these things. It was a ton of fun! Oh, one last thing. We managed to get several folks interested in ZS. Hopefully they'll be around at some point! some things that derek missed....at some ranges they do AQTs at 50 yards and sometimes add in full range shooting depending on the location. Elbow pads (or a shooting jacket) are very helpful since you spend a lot of time prone working on your skills. Since it is the Revolutionary War Vetrans Association that runs it there is a lot of history of the war told during lunch and breaks. Last weekend was the anniversary of the second battle of Saratoga so we got a run down of that as well. It really puts into persective where some of these traditions come from. One thing we both forgot! 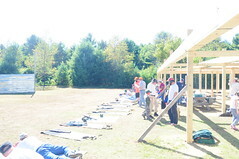 Going to an Appleseed Shoot counts as the required shooting activity for the Civilian Marksmanship Program. Joining the Revolutionary War Vetrean's Association (parent org to Appleseed) counts as the affiliated club. So if you do this, you can buy M1 Garands, 22 target rifles and discount ammo through the CMP. Good deal all around. I also attended this Appleseed event and it's where I learned about ZS from the t-shirts of some of you. It was a fantastic time and I plan to go again and drag some people with me too. I had plinked before, but it was my first instructional experience and I really learned a lot. If you're lucky, they'll have lender LTRs (Liberty Training Rifles) you could use. They're 10/22s with some modifications. My factory 10/22 had sights that couldn't be easily zeroed (6" high and 3" right at 25 yards!). I used the lender and am ordering the parts to upgrade mine. The upgrades are Tech100 sights, an extended mag release, and a USGI sling. I also ordered the bolt release improvement that is not essential, but I really liked it. Total cost is ~$120 including shipping. There's a lot more about the upgrades on the Appleseed forum. I'll try to post when I do the work with pics and notes. The demographics were primarily male (~85%) and maybe 40-50 average age. There were a bunch of repeat attendees, but mostly newbies. One 9 year old girl with her dad out-shot most of us. Next to me I had a ~50 yr old woman who had never shot before, a guy in the NYPD from Brooklyn, and a couple who had been to a bunch of Appleseeds and the wife is going to be an instructor next year. Pretty laid-back crowd, no ego problems, and every one was careful to observe the copious safety protocols. (Except a few people who thought the FIRE command was a starting gun and jumped the gun.) 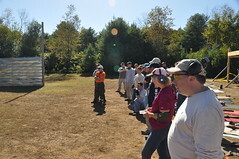 Most importantly, everyone at the range acts as a safety officer and took that seriously. The biggest take-home message for me was that a two-way incident would be more serious than you expect it to be and represent a failure of civilization (or "civilized" people) on a lot of different levels, so you should work harder (and inspire others to work hard) to keep it from ever coming to that. One of the instructors asked if anyone expects to effect change with an MBR and 5000 rds in their basement and no one raised their hand. Because that's dumb. Sunscreen? Yup, better bring it. I didn't the first day and made sure to bring some on Sunday. .22 LR is probably preferred. I shot ~550 rds and that would have cost a bundle (and made me really sore) in any other caliber for not much more education. If I get a heavier rifle, I'd bring it and the 10/22 to alternate. I'd bring binoculars too. After each set is over, I'd get impatient wanting to see how I did. 25 yards is a lot farther away than you think. But don't go and buy a pair just for this. If you have an industrial-style stapler, bring it. You need it for mounting targets and will just have to borrow someone else's. Finally, remember to breathe, keep track of how many shots you've taken at each target, and NPOA, NPOA, NPOA!